2. Place sachet and all ingredients in boiling water. 3. Simmer for 45 mins on low heat. 4. Turn off fire and garnish with spring onion. Serve hot. Note: Requires no additional seasoning. 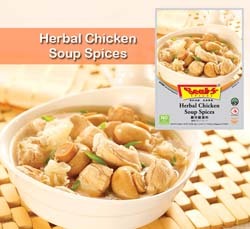 © 2011 - Seah's Spices Food Industries Pte Ltd. All rights reserved.